From December through February, Missouri's winter eagle watching is spectacular. Discover nature with the Missouri Department of Conservation (MDC) through Eagle Days events around the state, or enjoy eagle viewing on your own. Because of the state’s big rivers, many lakes, and abundant wetlands, Missouri is one of the leading lower 48 states for bald eagle viewing. Each fall, thousands of these great birds migrate south from their nesting range in Canada and the Great Lakes states to hunt in the Show-Me State. Eagles take up residence wherever they find open water and plentiful food. More than 2,000 bald eagles are typically reported in Missouri during winter. MDC Eagle Days events are listed below. They include live captive-eagle programs, exhibits, activities, videos, and guides with spotting scopes. Watch for eagles perched in large trees along the water's edge. View them early in the morning to see eagles flying and fishing. Be sure to dress for winter weather and don't forget cameras and binoculars. MOUND CITY: Dec. 1 from 9 a.m. to 4 p.m. and Dec. 2 from 10 a.m. to 4 p.m. at Loess Bluffs National Wildlife Refuge near Mound City. Call 816-271-3100 for more information. KANSAS CITY: 5 from 9 a.m. to 3:30 p.m. and Jan. 6 from 10:30 a.m. to 3:30 p.m. at Smithville Lake Paradise Pointe Golf Course Clubhouse north of Kansas City. Call 816-532-0174 for more information. LOUIS: Jan. 19 and 20 from 9 a.m. to 3 p.m. at the Old Chain of Rocks Bridge south of I-270 off Riverview Drive in St. Louis. Call 314-301-1500 for more information. JEFFERSON CITY: 26 from 10 a.m. to 3 p.m. at the MDC Runge Conservation Nature Center. Call 573-526-5544 for more information. CLARKSVILLE: 26 from 9 a.m. to 4 p.m. and Jan. 27 from 10 a.m. to 3 p.m. at Lock and Dam 24 and Apple Shed Theater in Clarksville. Call 660-785-2424 for more information. PUXICO: 2 from 9 a.m. to 3 p.m. at Mingo National Wildlife Refuge, Puxico. Call 573-222-3589 for more information. 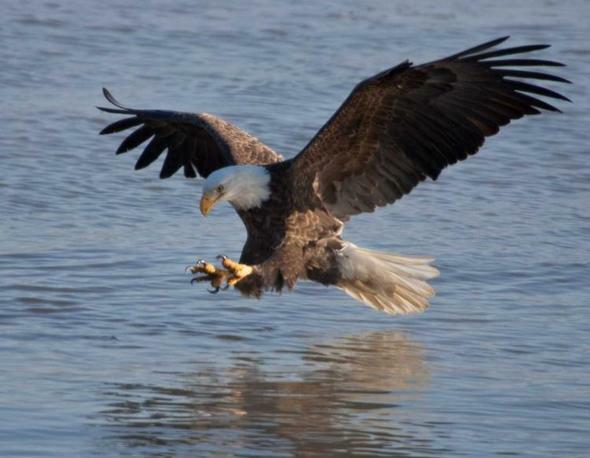 Mark your calendar for the MDC Wild Webcast: Bald Eagles and Eagle Days Dec. 4, noon to 1 p.m. where MDC Resource Scientist Janet Haslerig and MDC Eagle Days Veteran Dan Zarlenga will share their expertise about bald eagles in Missouri and the perennially popular MDC Eagle Days events around the state. Register at short.mdc.mo.gov/ZT7. For more information on Eagle Days, visit mdc.mo.gov/EagleDays. Discover nature with MDC through Eagle Days from December through February. Learn more at mdc.mo.gov/EagleDays.